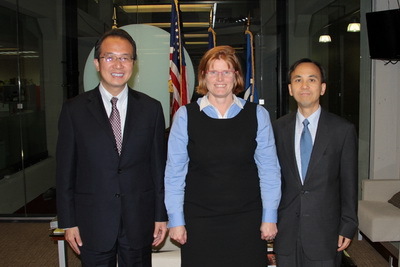 On October 6, Consul General Hong Lei met with U.S. Senator Amy Klobuchar's District Director Ben Hill and U.S. Senator Al Franken's District Director Alana Petersen in Minneapolis and Saint Paul respectively. Consul General Hong Lei introduced the cooperation and exchanges between China and Minnesota in economy, trade, culture and education and the development of China-US relations. 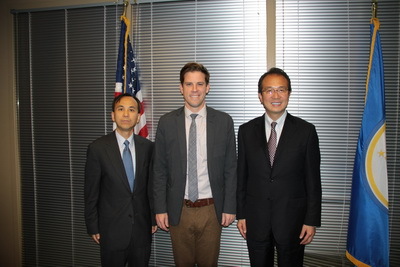 He said that China-US relations are one of the most important bilateral relations in the world. The two countries share common interests in a wide range of areas and have important common responsibilities in international affairs. Minnesota's cooperation with China has great potential. The Consulate General would like to work with the two U.S. senators and their district offices to jointly promote the friendly cooperation between China and the Midwest, especially between China and Minnesota and the continuous development of China-US relations. Director Hill said Senator Klobuchar pays close attention to US-China relations and has visited China before. She believes that cooperation between the two countries in various fields is very important. As Minnesota is an agricultural state, Senator Klobuchar attaches great importance to strengthening agricultural cooperation between Minnesota and China. Director Petersen said that he is happy to see the cooperation between China and Minnesota becomes more and more fruitful. With its own advantages, Minnesota can strengthen its cooperation with China in agriculture, environmental protection and new energy.